Final Fantasy 1 and 2 Dawn of Souls GBA Game Boy Advance Game Cartridge Cleaned Tested and Guaranteed to Work! Great GBA versions of FF1 and FF2 for the NES. Graphics and gameplay are amazing compared to the Nintendo versions of the 2 games. Too bad FF2 is more complicated to master. Holy Cow, Final Fantasy on the handheld!!! Get this title today!!! very fast shipping, game looks brand new, works great will be buying here again. This game arrived very quickly to me here in Canada. This is my very first rpg game I have played, and I think I choose correct. Right now about half way through FF1, and am loving it. So much fun and very addictive. Highly recommend you pick this one up. Finally, a Final Fantasy remake done right! The trend of remaking Final Fantasy titles for newer systems began, at least in the US, with the rather horrible Final Fantasy Anthology on the Play Station. That collection included Final Fantasy 5 (up until then never released in the US), and Final Fantasy VI, which was previously released in the US as Final Fantasy 3. The problem, aside from the rather horrible effort at translating Final Fantasy V, was that the games were not updated in any way to make them better compatible with their new format. The games were basically dumped onto Play Station discs with only the barest modification to make them run at all in that form. The result is that both games suffer from severe load times, FF6 more so than FF5. The audio also suffers as a result of this change. The same thinghappened with Final Fantasy Collection, which featured Final Fantasy IV (previously released in the US as Final Fantasy II for the SNES), and Chrono Trigger, not in fact part of or even connected to the Final Fantas series but included in this package anyway for some reason. As with Anthology the games both suffered from their haphazard porting. Fortunately when they released Final Fantasy: Origins, Square/Enix finally did the job right. Origins contained the original Final Fantasy, previously released on the NES, and Final Fantas 2, the actual Final Fantasy 2, not the Final Fantasy 2 we got for the SNES in the US. After Origins, this Dawn of Souls package was released. The games were basically the same games as in the Origins package, right down to the music. The difference is that a bonus dungeon was added to each game for this version. The controls for both games are fairly responsive. They're the standard RPG fare, move with the D-Pad, talk with A and dash with B where applicable. The music is the same as in the NES versions, though updated for the new platform and with some new tracks added to both games. This is an especially good thing in the case of Final Fantasy I, which originally featured just one battle theme throughout the entire game, even for the final battle. The original Final Fantasy II had one additional battle theme, reserved for major boss battles, but that was it. Now, both games have several new battle themes for various types of boss fights. 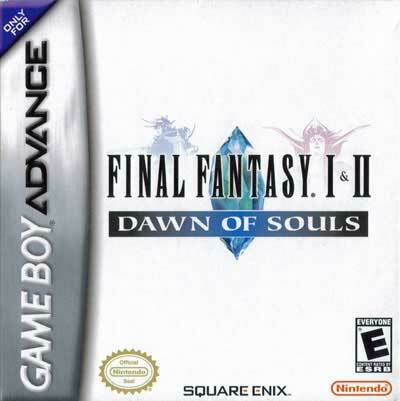 In fact if you're familiar with Final Fantasy Origins you'll be familiar with the music in the Dawn of Souls port since it's exactly the same. Story wise the games are nothing special. In Final Fantasy I, you play the role of four young warriors dispatched to restore the four crystals of the elements, pretty much a staple of many of the early Final Fantasy games and a few of the later ones as well, to grace. In Final Fantas 2, you play the role of a band of young heroes attempting to thwart the global aspirations of a tyranical emperor. But this may be harder than it seems, for the emperor, quite apart from being willing to sacrifice innocent lives for no other reason than he can, has apparently reached into the darkness to draw forth demons to aid him in his conquest. This was the first Final Fantasy remake I played and genuinely liked. I got it for Christmas ten years ago and have beaten it many times since then. If you haven't played it yet you might just be in for a treat. First FF games was FF7 on playstation 1 and have been a hooked fan ever since even of the old school ones. When i got this i was eager to play. Really fun if your still into the old school FF. Only part that was kinda of difficult was it was a bit more difficult to keep up with the story line than the other games. I had to go online and look up a map cuz there doesnt seem to be one that you can access to tell where you are....and the world is very large! Otherwise, very fun game. Grandaughter was very happy with this game she got for christmas it works great and thanks for great service.